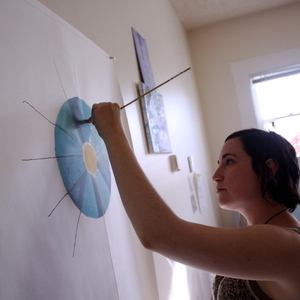 Eve Arbel is a professional visual artist working and living in Oakland, CA. She holds a bachelors degree in Practice of Art from UC Berkeley, where she graduated with an Excellence in Painting award in July 2012. Eve has exhibitted in Berkeley at Firehouse North Gallery, Worthy Ryder Gallery, and the Foundry, where she was an Artist in Residence. Eve is pursuing exhibitions, curatorial projects, and arts education. She is currently creating a new body of work. Artist Statement: I'm interested in how art can deepen the mystery of beauty. Through my work, I seek to raise questions, leave them floating in the air, and allow the viewer to draw her or his personal conclusion. I want to give the viewer a place to pause and sit with the mystery. My paintings explore the powerful and quiet force of nature through motifs of cycles, growth, and destruction. While flattening an image through abstraction, I create depth though a process of push and pull with the medium. Playfully investigating a medium's limitations, I intuitively make marks, often covering them and remaking them until I reach a state of balance in the painting. I am curious about how a series of covered-up mistakes can become beautiful; how an image can emerge from the chaos of marks.